Written by Rhea Alexander, Founder and Director of Parsons ELab and Assistant Professor of Strategic Design and Management at Parsons, The New School and Research Assistant Vinay Kumar Mysore. Designing in and for transition, within contexts of constantly changing certainties and boundaries, demands new models of pedagogy; capable of building deep competencies within students beyond the studio’s borders. Academia is facing radical disruption as students demand a redefinition of education (Traitler,Coleman and Hoffman, 2014). This transformation must be applied within design education. How do we educate designers to design for present ambiguity and future uncertainties in a world with radical complexity and wicked problems? 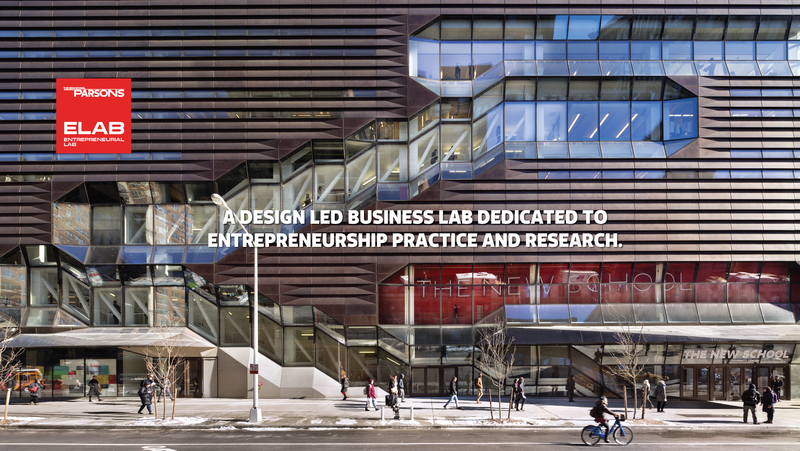 Parsons ELab is a design-driven academic business incubator and research lab with the ambitious mission to develop a distributed academic incubation model. 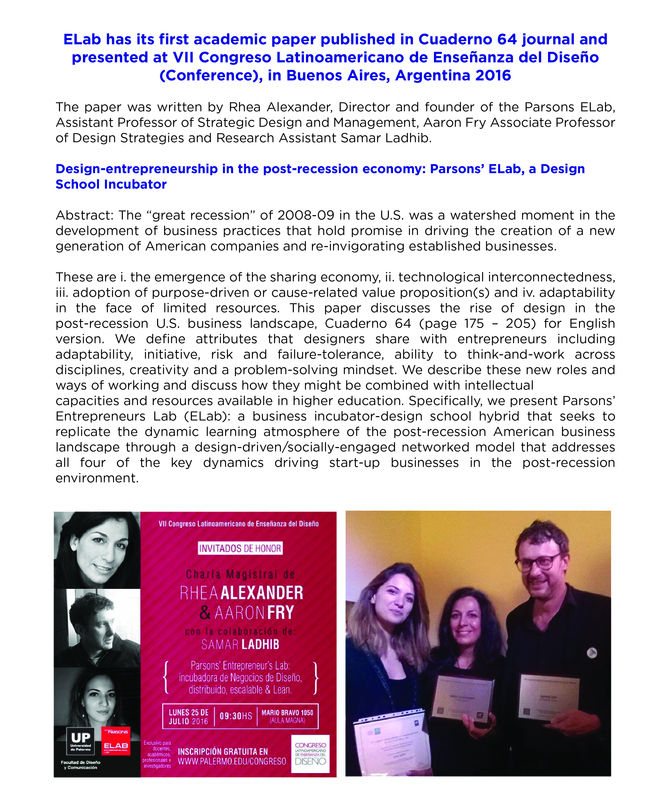 Our research investigates how to transition design education and its evaluation, create models for future academic distributed incubators, and new research methodologies to incubator and accelerator research. Conventional incubation research is focused on understanding the financial impact of incubees through their period of incubation (Messeghem et al, 2017). Parsons ELab has developed a mix of deep qualitative and quantitative research to build a broader view of impact. Our research offers a unique perspective in evaluating educational, financial and social impact. We find a need to challenge conventional approaches to entrepreneurship research and education. Our findings develop necessary practices in the implementation of distributed academic incubator models. ELab continues to refine its methodology as it works towards a roadmap for other institutions seeking to encourage design-driven entrepreneurship. Our work expands definitions of impact. 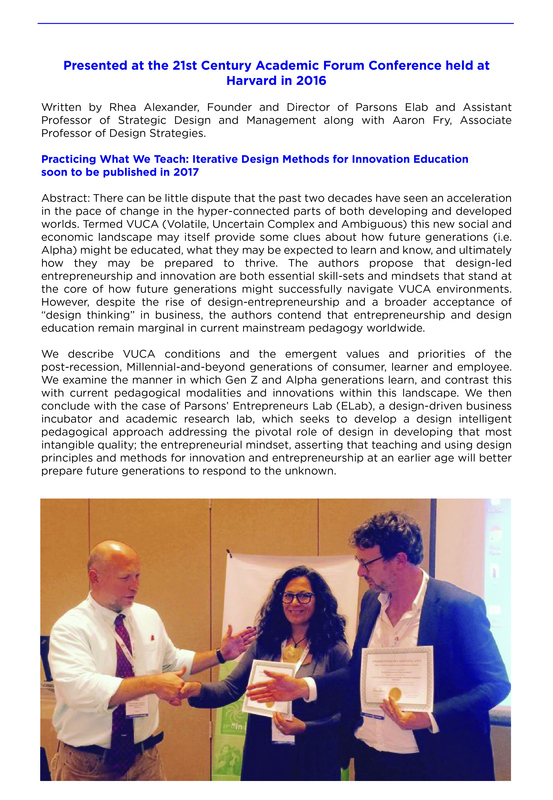 As we identify new transitions and needs for design-driven, entrepreneurially-focused education, we look to develop new pathways for design students to develop critical competencies. Written by Rhea Alexander, Founder and Director of Parsons ELab and Assistant Professor of Strategic Design and Management, Aaron Fry, Associate Professor of Design Strategies and Research Assistants Aryanna Martin and Vinay Kumar Mysore. By 2015, 53.5% of U.S. workforce participants were Millennials; a majority that will grow over the next few decades as this generation influences economic development. Here we highlight Millennial workers’ prioritization of purposeful work, values-driven corporate citizenship and work-life balance, arguing that start-up business entrepreneurship, coupled with strategic design promise to play an important role in reimagining workplace wellness for this generation. We discuss the role of strategic design innovation in the entrepreneurial context, presenting key insights about the design process derived from interviews with six Millennial generation start-up founders-graduates of Parsons’ Entrepreneur’s Lab incubator-who deploy design methods and tools in a business context to re-imagine and innovate ‘human capital’ wellness and work environment. Alexander and Fry represented ELab in November 2017, when they submitted an extended abstract and presentation request, subsequently accepted to the Design4Health conference at Swinburne in Melbourne, Australia on December 4-7, 2017. The two presented a deck at the conference and the findings presented, titled “Strategic Design and the Future of Work-and-Wellness,” has been submitted in January 2018 for the Taylor and Francis Journal Design for Health – a rigorous double-blind peer reviewed journal. The submission is comprised of a 47-page paper that includes 5 case studies and data from 5 companies out of the ELab. This comprehensive survey will map the impact our entrepreneurial alumni have had economically, socially, creatively — in whole, visualizing a display of The New School’s entrepreneurial genome. COLLECT – We want to measure and map the numbers and locations of self-declared entrepreneurial alumni over time, focusing primarily on the last 100 years. MAP – Subsequently, we will use resources in data visualization to map the results of this widespread collection, displaying entrepreneurial alumni locally and globally further refined by social, cultural and/or economic value. IMPACT – The goal of this initiative is to create an engaging visualization and positively impact alumni engagement, as well as assess and demonstrate the collective impact and industry of all surveying and collected alumni. DEVELOP – The resulting holistic perspective will contextualize and initiate greater consideration and proof of entrepreneurship at The New School, and provide context for the many growing endeavors around entrepreneurship developing at the university. SHARE – We aim to share the results of this study in many forms and through many public, including a 100-Year interactive timeline to celebrate the Centennial.